Copresented with the New Museum and Creative Time Reports. For more of Perry Chen's work on the topic of Y2K, see the online exhibition "Computers in Crisis" and the upcoming event Y2K+15, Friday, December 12 at the New Museum in New York. Perry Chen, Selection from Computers in Crisis, 2014. 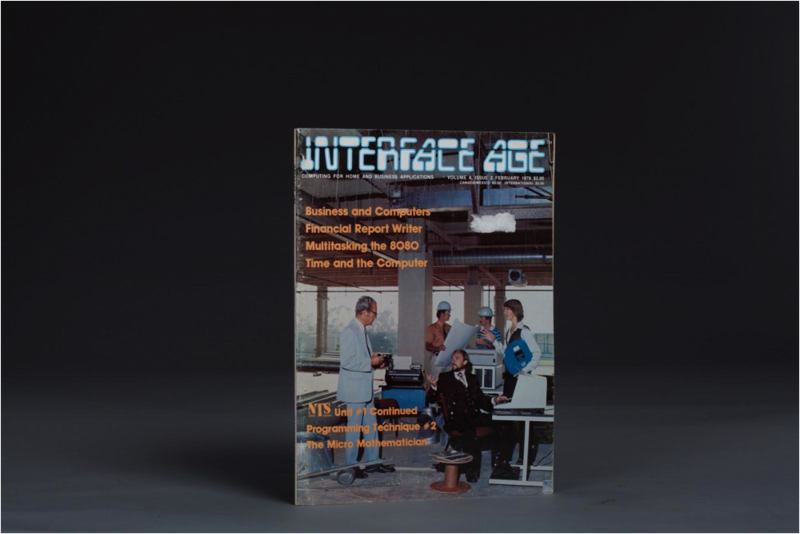 Photograph of journal included as part of the artist's archive:Interface Age, February 1979. Courtesy the artist. In a February 1979 issue of Interface Age, Bob Bemer, who is known as the father of ASCII (once the most common standard for encoding text characters in binary code), relayed a prophetic warning about the potential threat that would, decades later, become known as Y2K: "Don't drop the first two digits for computer processing, unless you take extreme care, remembering that it's only the 'year of the century.' Otherwise the program may fail from ambiguity in the year 2000." Bemer had long questioned the widespread use of two- rather than four-digit year dates in computer systems—a shortcut to save precious and expensive memory. In 1960, 40 years before Y2K, he campaigned for a universal switch to a four-digit year date standard. Bemer didn't give up his fight to sound the alarm about two-digit dates. Years later, according to Anson, he "recruited the presidential science advisor, Edward E. David, to plead the case in person. Nixon listened, then asked for help fixing his TV set." Perry Chen, Selection from Computers in Crisis, 2014. Photograph of magazine included as part of the artist's archive: TIME, Jan. 18, 1999. Courtesy the artist. By late 1998 the date issue was being taken very seriously, and Y2K concerns were at their height. Government and industry were spending at an increasing pace to avert failures in critical systems that could cause widespread and unpredictable problems. Many popular Y2K scenarios involved chain reactions of computer malfunctions that would cripple electrical grids and water supplies due to the vast and growing interconnectivity of many systems. 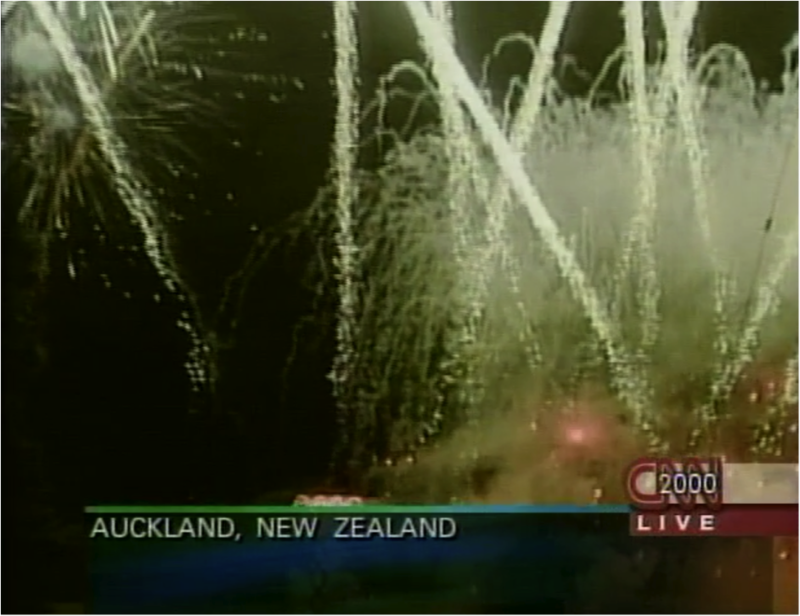 New Year celebrations in Auckland, New Zealand, the first major city to enter the new millennium without any Y2K-related crises unfolding. Screenshot of CNN footage courtesy the artist. January 1, 2000, arrived first in the South Pacific, on the tiny Millennium Island, which had been renamed and realigned across the international date line to capitalize on the millennium hype. Shortly thereafter, Auckland, New Zealand, became the first major city to pass the Y2K test. Thirteen hours later, Greenwich Mean Time, which many computer systems rely on, reached midnight without any major incidents reported. "At the U.S.-Russian Center for Year 2000 Strategic Stability ... applause broke out as midnight arrived in Moscow. 'You can see the lights are on in Moscow, and that Y2K is not a problem there,' said Col. Sergey Kaplin, the Russian military commander. 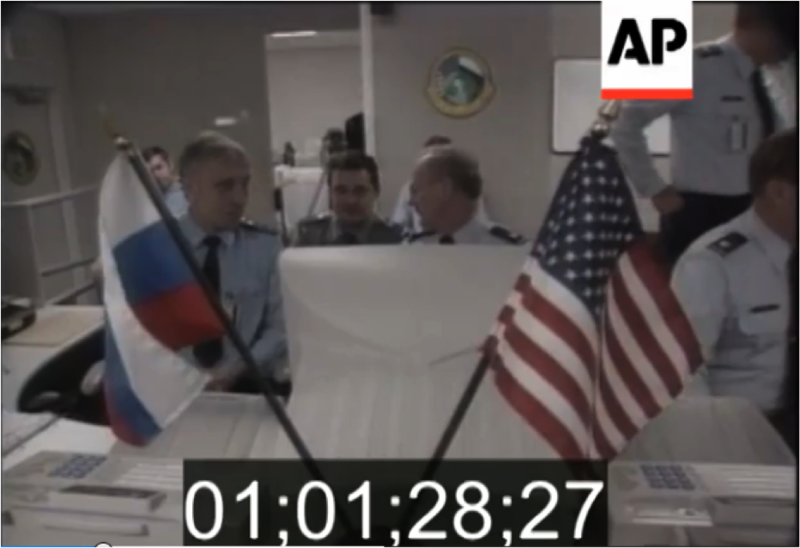 … As the Russian and American commanders shook hands, Staff Sgt. Charles Dike lifted a toast of mineral water to the Russian officer sitting next to him." —Judith Graham, Chicago Tribune, Jan. 2, 2000. Perry Chen, It’s Not Too Late / It’s Already Too Late, from "Computers in Crisis," 2014. Courtesy the artist. 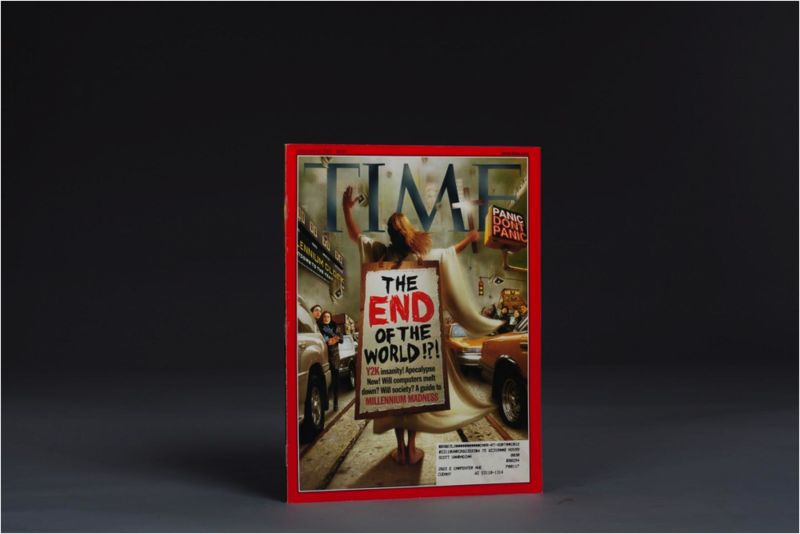 Was Y2K a crisis prevented or overblown? Why did countries that spent next to nothing on Y2K not experience any major issues? 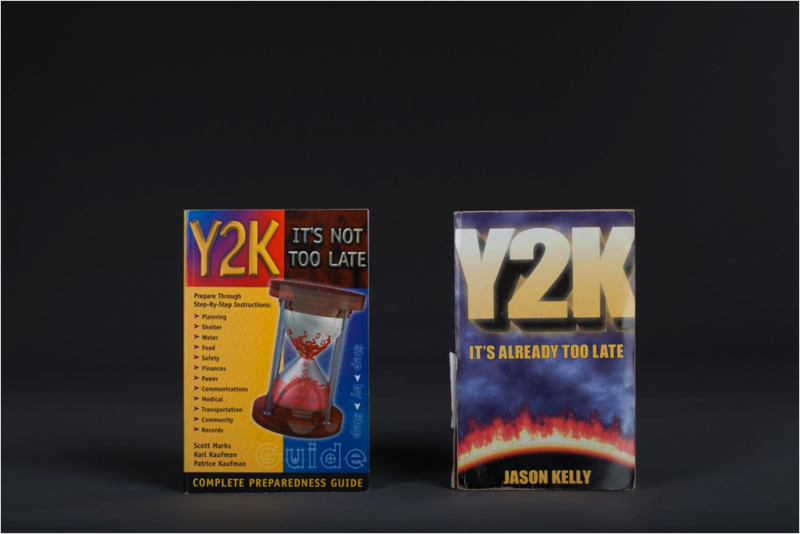 Could the uncertainty around Y2K have been approached in a radically different way? Y2K did not lead to disaster. But it also did not lead to answers. And until it became a punch line fading away in our memories, Y2K crystallized something bigger: that we were drifting into a new era in which our understanding of the complex systems we were creating was becoming truly limited. And that we would need to learn to negotiate this new paradigm. "I have come to believe that the Y2K apocalypse is a myth. The truth is not that civilization will come to an end, but rather that civilization as we once knew it has ended already. We are no longer in complete command of our creations. We are back in the jungle, only this time it is a jungle of our own creation. The technological environment we live within is something to be manipulated and influenced, but never again something to control. There are no real experts, only people who understand their own little pieces of the puzzle. The big picture is a mystery to us, and the big news is that nobody knows."